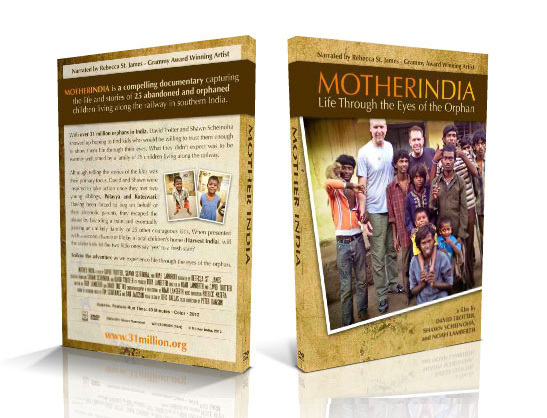 Narrated by Grammy Award winner Rebecca St. James, MOTHER INDIA: Life Through the Eyes of the Orphan is a compelling documentary capturing the life and stories of 25 abandoned and orphaned children living along the railway in southern India. With over 31 million orphans in India, David Trotter and Shawn Scheinoha showed up hoping to find kids who would be willing to trust them enough to show them life through their eyes. What they didn’t expect was to be warmly welcomed by a family of 25 children living along the railway. Although telling the stories of the kids was their primary focus, David and Shawn were inspired to take action once they met two young siblings, Polayya and Koteswari. Having been forced to beg on behalf of their alcoholic parents, they escaped the abuse by boarding a train and eventually joining an unlikely ‘family’ of 25 other courageous kids. will the older kids let the two little ones say ‘yes’ to a fresh start? Follow the adventure as we experience life through the eyes of the orphan.